Today in Kyiv, the plenary session of the 19th Ukraine-European Union summit is held with the participation of the President of the EU Council Donald Tusk and President of the European Commission Jean-Claude Juncker. The meeting began with the ceremony of meeting the European guests with the President of Ukraine Petro Poroshenko. According to the QHA correspondent, the Presidents exchanged friendly greetings and strong handshakes as a sign of unity of Ukraine and the European Union. At the plenary session, Petro Poroshenko noted the importance of the visa liberalization for Ukraine with the EU, stressing that about one hundred thousand Ukrainians were already able to use it. "The Ukrainians could see with their own eyes what is visa liberalization and the European Union, where we are going and what we should fight for," he said. The President went on saying that the visa liberalization has become "a real watershed between the Soviet past and the European future of Ukraine" and no country has paid such a high price for being a part of Europe. Even before the summit, Petro Poroshenko stated that the issue of moving to a new stage of the partnership between Ukraine and the European Union is to be discussed. The summit is expected to welcome the final ratification of the Agreement on the Association of Ukraine with the EU, which will enter into force on September 1. 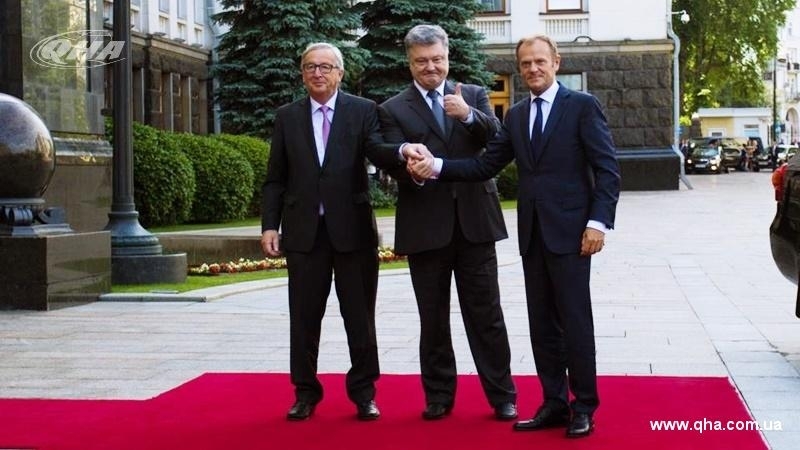 Reference: On Wednesday, July 12, the 19 th Ukraine-EU summit opened in Kyiv. The event began with a working dinner of EU leaders with Ukrainian President Petro Poroshenko. As part of the EU delegation to Kyiv, the President of the EU Council Donald Tusk, the President of the European Commission Jean-Claude Juncker, the EU High Representative for Common Foreign and Security Policy Federica Mogherini, arrived in Kyiv, as well as the Vice President of the European Commission Valdis Dombrovskis, the European Commissars Cecilia Malmström and Johannes Hahn.